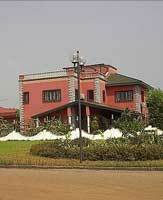 In Accra, the country's capital, the average house price was GHS315,000 (US$86,957) in mid-2013, about 12% higher than in the rest of Ghana, based on a collection of house prices listed on Tonaton.com. In recent years Ghana has seen a steady stream of other European and American passport holders of African descent arriving at Kotoka International airport, responding to the resource boom and a manufacturing boom. They collect their possessions from shipping containers at Tema port and search for homes in Accra's popular residential areas. They are coming for what seem like the limitless opportunities in what has often been seen as one of Africa's best-run countries. Mercedes and Lexus abound, with designer label clad passengers. The district around the embassies and consulates is awash with the totems of success - giant satellite dishes, gated driveways that stretch into the distance. There are luxury housing estates that would not be incongruous if situated in Beverly Hills. The social elites and expatriates can find all their home comforts and Western goods at prices far in excess of the average Ghanaian's pocket. Supermarkets and restaurants cater to their every need in air-conditioned comfort. But for all the hype about Ghana's growth and its good government, the country is now in trouble again. The country has just decided to begin the process of applying for an IMF bailout. Rental Income: Rental income earned by residents from leasing residential properties is subject to a final withholding tax of 8% levied on the gross rent. Capital Gains: Capital gains are taxed at 15%. Inheritance: No inheritance tax is levied in Ghana. However, a 15% gift tax is imposed on the transfer of properties (or any right or interest in such) by way of gift. Residents: Residents are taxed on their worldwide income at progressive rates, from 0% to 25%. Total round-trip transactions costs, i.e., the cost of buying and selling a property, range widely from 8.25% to 16% of the property price, due to the multiplicity of land titling issues. The seller pays the 5% real estate agent’s commission. The buyer pays the stamp duty ranging from 0.25% to 1%, and legal fees ranging from 3% to 10%. Real estate transactions are negotiated and concluded in Ghanaian Cedi (GHC). English is the official language. 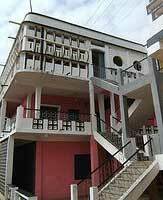 Rental market practice in Ghana is pro-landlord. Rent: Rents can be freely negotiated and rent increases are unrestricted. In practice, a landlord charges one to three years rent in advance, though according to the Rent Act, landlords can only charge six months rent in advance, with succeeding rental payments due every six months. Pre-termination of Contract: If the tenant wishes to pre-terminate a contract, he must inform the landlord three months in advance. In most cases, the tenant must look for someone to take over the lease for the duration of the contract or wait for the repayment for months. Once hailed as a model for African growth, Ghana has recently been losing its shine with slowing economic growth, surging inflation, and mounting government deficit. Economic management under the current government has been week. Two weeks ago, the government was forced to announced a decision to opt for an IMF bailout in order to save the ailing economy from sinking further. July 2014, thousands of Ghanaians demonstrated street protests against what they call the government’s mismanagement of the economy since President John Mahama took office in January 2013. Ghana’s economy expanded by 6.7% year-on-year in the first quarter of 2014, a slowdown from the 9% annual growth rate seen in the same period last year, according to the Ghana Statistical Service. The agriculture sector registered the highest annual growth rate, at 12.7%, while the industry sector saw a decline of 1.1%. In July 2014, the country’s annual inflation rate surged to 15.3%, the highest level in four years, mainly fuelled by increases in the price of utilities and fuel, according to government figures. This was above central bank’s inflation target of 13%, plus or minus 2%. Inflation is expected to rise further after the harvest season if the government fails to slow its borrowing. By end-March 2014, the country’s public debt stood at GHS58.4 billion (US$16.12 billion), equivalent 55.4% of GDP, according to the central bank. Ghana (pop. 25.5 million, GDP/cap US$1,730) is a very poor country. Formerly known as the Gold Coast, it was the first country in sub-Saharan Africa to gain independence from Britain in 1957. After independence there was a long power struggle, after the socialist one-party state established by independence leader Kwame Nkrumah was followed by a series of military coups. Jerry Rawlings overthrew the government in 1979, and gained popularity by instituting price controls. He moved the country towards an increased role for the private sector, relinquished power to an elected government headed by President Hilla Limann (1979-81), but soon overthew Limann. He then abolished the constitution, suppressed dissent, and established a program of self-sufficiency and austerity, while surviving four coup attempts. He won free presidential elections in 1992 and 1996, serving until 2001. In the presidential election of 2000, Rawling's National Democratic Congress sponsored John Atta-Mills, but he was narrowly defeated by the conservative New Patriotic Party, whose candidate John Kufuor became president in 2001. The economy had expanded under Rawlings, averaging 4% annual GDP growth from 1992 to 2000. The recovery of global gold and cocoa prices (the country’s major export commodities) helped in the early 2000’s. But it was Kufuor's government which was highly successful, bringing economic growth, halving the level of poverty, introducing free medical care and free meals in schools. When Kufuor gave up power in 2008 the National Democratic Congress' John Atta Mills won the election. But in 2012 Mills died and power passed to his vice-president John Dramani Mahama, who won the 2012 election. His term has not been a success. The economy grew by 5.5% in 2013, after annual GDP growth rates of 7.9% in 2012, 15% in 2011, and 8% in 2010, according to the International Monetary Fund (IMF). The economy is projected to grow by about 4.8% in 2014.